SAN FRANCISCO – April 17, 2019 – The Zephyr™ Project, an open source project at the Linux Foundation that aims to build a secure and flexible real-time operating system (RTOS) for the Internet of Things (IoT), today announced a technical milestone with the first Long Term Support (LTS) release. The Zephyr 1.14 LTS release, which has been developed by the diverse Zephyr community of almost 500 contributors, will offer vendors a customizable operating system that supports product longevity, security and interoperability. In today’s technology landscape, developers have a plethora of choices for platforms, boards and other components. They are challenged to create secure products that integrate with other proprietary and legacy solutions. With the Zephyr LTS, developers aren’t locked into a particular architecture, back-end platform or cloud provider and will have the freedom to choose from an ecosystem of hardware. The Zephyr TSC is actively working towards safety certifications with the International Electrotechnical Commission (IEC) and the International Organization for Standardization (ISO). The project plans to submit key parts of the Zephyr kernel and operating system services based on the LTS release for safety certification. These certifications are important as they indicate a product has undergone careful review and testing and is deemed trustworthy in safety-related systems. More information about the plans for functional safety can be found in this blog. Additionally, the Zephyr Project earned the Core Infrastructure Initiative (CII) Gold Best Practice Badge, which means it is following best practices and conformance in driving secure software development in open source. The Core Infrastructure Initiative is a collaborative, pre-emptive program and approach for strengthening cyber security that has been adopted by more than 2000 projects. The CII Best Practices Badge is a rigorous assessment of an open source project’s processes and infrastructure. The Zephyr Project is one of three open source projects that has achieved the gold badge status. Hosted by the Linux Foundation, the Zephyr Project aims to establish a neutral community where silicon vendors, Original Equipment Manufacturers (OEMs), Original Design Manufacturer (ODMs) and Independent Software Vendor (ISVs) can contribute technology to reduce the cost and accelerate time to market for developing the billions of IoT devices. 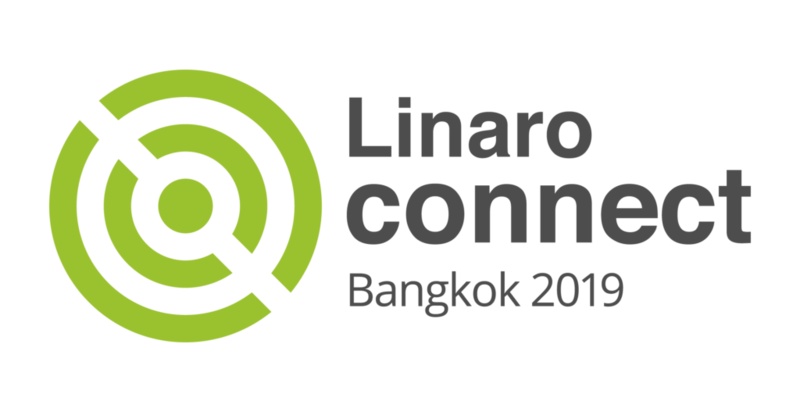 Project member companies include Antmicro, Foundries.io, Intel, Linaro, Linino.org, Nordic Semiconductor, NXP, Oticon, SiFive, Synopsys and Texas Instruments among others. Zephyr offers the smallest memory footprint and a secure and flexible RTOS that extends functionality of IoT devices. It is a customizable, embedded open source platform that works with multiple hardware architectures. The dedication and talent of the growing Zephyr technical community has resulted in rapid expansion in board support as well as attracting an average of 20 new contributors each month. Currently, Zephyr supports more than 160 board configurations comprising of different architectures including: ARC, ARM, NIOS II, RISCV32, x86, x86_64 and XTENSA processor families. For the complete list of boards and details, visit the Zephyr Github page. To learn more about the products that use Zephyr RTOS, visit the Zephyr website and blog. When we started the Zephyr project, we knew at some point in the future, we’d want to incorporate having periodic Long Term Support (LTS) releases. Now that we’re close to the launch of Zephyr’s first LTS, it’s a good time to reflect on the benefits an LTS provides and why the project is doing this. Since the project launch, the Zephyr code base has been evolving rapidly, as developers joined in and have been participating in shaping Zephyr into something that suits the products they want to create on top of it. From Linux, and other open source projects, we’ve learned that having an LTS is an excellent tool for companies who don’t want to be tracking the latest development code base, but want a supported operating system to use when creating products. When companies put out products they need to support them for a specific, often extended periods of time. 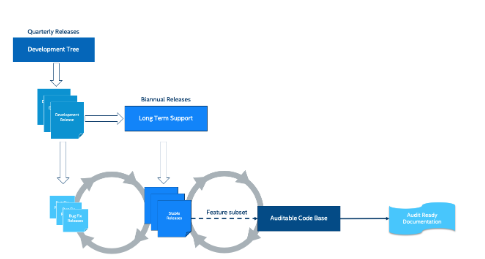 By basing a product on an LTS, a company can take advantage of the shared support providing security and severe functional fixes as issues are discovered over time. One of the goals of this LTS has been stabilizing the Application Programming Interfaces (APIs). By testing and stabilizing these interfaces to the operating system, we create a sound and stable foundation for applications. The Zephyr Project’s Technical Steering Committee (TSC) explicitly decided on using 2 quarters for developing this release last October, so that the APIs could be stabilized and the code base could be prepared for creating an auditable version. For Zephyr to make a development release, the number of known bugs must be less than an agreed upon threshold, but for an LTS this threshold is even stricter. For an LTS, no high-severity bugs, only 20 medium-severity and 50 low-severity are allowed. A regular development release did not have criteria on the number of low-severity bugs permitted. The more bugs we squeeze out of the code base before the release, the better. The LTS release will be maintained and have security fixes back-ported onto it, for at least the next two years. It is not a target for new features or substantial improvements, that’s what the next development releases are for (which will resume on their quarterly cadence after this release is made), but is going to be a stable base that the project can use as a foundation to start to pursue getting the Zephyr code base certified to comply with safety and security standards. If severe or security-related bugs are found during the process of going through certifications, they will be fixed in the LTS, as well as in the main development code base. Stay tuned for more details about Zephyr’s new LTS release. In the meantime, to learn more about Zephyr’s release processes, documentation is available at: https://docs.zephyrproject.org/latest/development_process/release_process.html and questions are welcome on Zephyr’s slack channels. The Bluetooth Special Interest Group (SIG) is the technical standards body behind Bluetooth technology. We’re responsible for facilitating the production of the engineering specifications that define how this ubiquitous wireless communications technology works and for the evolution of the technology, working with some of the world’s leading experts from organisations that are members of the SIG. And so far, over 35,000 companies have joined the SIG to back Bluetooth and influence the future direction that it takes. Developers play an essential role in the success of Bluetooth. Stack developers implement Bluetooth. Applications developers use Bluetooth, often in surprising and creative ways. I’m a member of the SIG’s Developer Relations team, looking after the EMEA region. The team’s responsible for informing, supporting and educating developer communities of all sorts; mobile application developers, web developers and embedded software engineers amongst them. We’re developers and technical architects ourselves, too. And so, we know, that sometimes going hands-on is the only way to really tackle a new and tasty technical subject. To that end, we’ve created a collection of educational resources known as study guides to help developers learn about Bluetooth from a variety of perspectives and to provide the opportunity to reinforce the theory with some practical work in the form of step by step development projects. The Zephyr RTOS has excellent support for Bluetooth, including Bluetooth Low Energy (LE) and Bluetooth mesh. Last year, I selected Zephyr to be the platform to base our Bluetooth Mesh Developer Study Guide on. Our most popular download though, is the Bluetooth LE Developer Study Guide (BLEDSG). This resource teaches the theory relating to Bluetooth LE when used for one to one connected communication between two devices. This involves aspects of the Bluetooth stack known as GATT (Generic Attribute Profile) and GAP (Generic Access Profile) and is the most common way in which Bluetooth LE is used. But theory isn’t everything and this study guide gives developers a range of projects they can really get their teeth into, whether they’re a smartphone developer or an embedded software engineer. There’s even some simple electronics involved, and your first task is to put together a simple circuit involving three LEDs, a piezo buzzer, a serial LCD display and a thermistor. You can then opt to develop the code for a peripheral device which allows the circuit to be controlled over Bluetooth using a smartphone. And yes, you can develop the smartphone application too if you want to, with projects available for Android and iOS developers as well as one which shows how to use Apache Cordova to create a platform agnostic application. The included theory primer will teach you key terminology and concepts, including the structure of the GATT attribute table, with its hierarchy of services, characteristics and descriptors which represent and allow control of the device’s various capabilities. 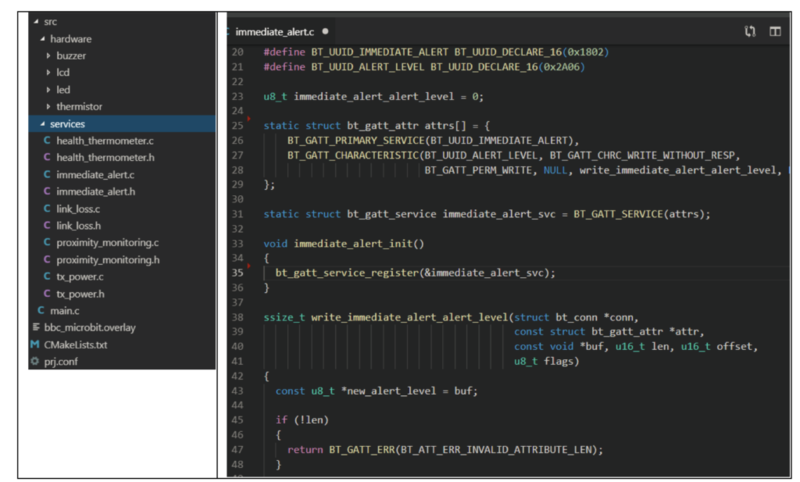 The development projects will give you practice implementing this structure and teach you how to use APIs to allow reading and writing characteristic values and to leverage capabilities such as Bluetooth notifications and indications. If you develop one of the smartphone projects, you will also learn how to use the RSSI (received signal strength indicator) to estimate how near or far the smartphone is from the Bluetooth peripheral device it is connected to. The latest release of the BLEDSG, version 5.1 adds a new hands-on project which uses a BBC micro: bit with Zephyr. Following the detailed instructions in the associated project guide, you will use Zephyr to implement a custom Bluetooth profile which allows the distance of the peripheral device from a connected smartphone to be tracked, uses LEDs and the buzzer to indicate when the connection has been lost (the GATT Link Loss service) and allows you to request that it generate a visual and audible alert (an implementation of the GATT Immediate Alert service), useful if you’ve misplaced the device! The electronics incorporates a thermistor, so you can also track the temperature of the device using a standard Bluetooth GATT service known as the Health Thermometer service. The Bluetooth SIG’s BLEDSG is the perfect way to learn about Bluetooth LE, GATT and GAP and Zephyr is an excellent platform for gaining hands-on experience in the process. It so happens it’s a lot of fun as well. Download the Bluetooth LE Developer Study Guide today and get coding with Zephyr and Bluetooth!